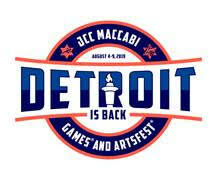 Brittany Feldman of Hazon Detroit, David Brown of Kibbutz Detropia, Rev. 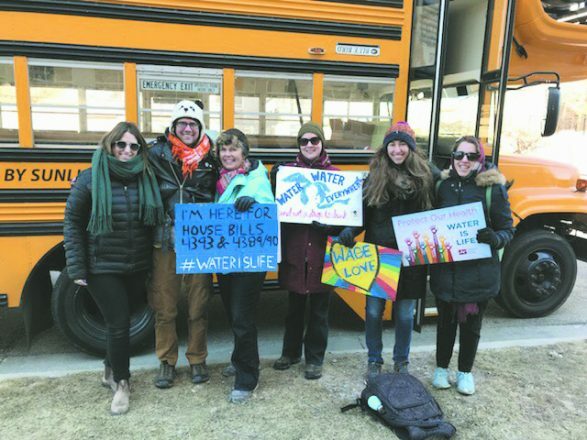 Deb Hansen, a board member of Michigan Interfaith Power & Light, Leah Wiste of Michigan Interfaith Power & Light, Ilana Unger of Hazon Detroit and Staci Rosen of Repair the World Detroit in front of Hazon’s Topsy Turvy Bus that runs on used vegetable oil. 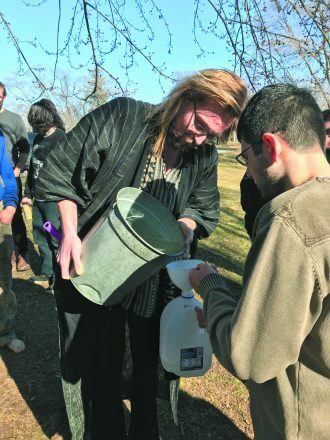 In mid-March, 25 participants joined Hazon Detroit to explore their senses through the sweet practice of “Forest Bathing,” immersing themselves in nature to help reap physical and psychological benefits. 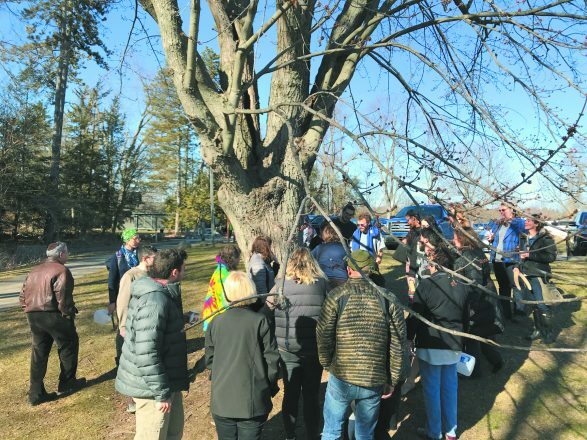 Cayla Samano, a certified forest therapist, and Brittany Feldman of Hazon led the group on a contemplative sensory hike where they learned how to identify and tap maple trees with Carol Fink and Bonnie Hollander from the Farmington Hills Nature Center. The day ended with a seasonal dinner, flavored with maple, from Soul Café in West Bloomfield. The group surrounds a maple tree that is ready to be tapped. Participants Carson and Raphael Davidov collect sap. 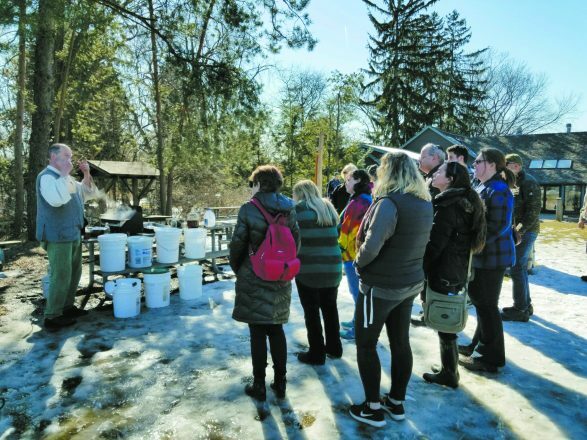 Naturalist Carol Fink from the Farmington Hills Nature Center explains how to collect sap. 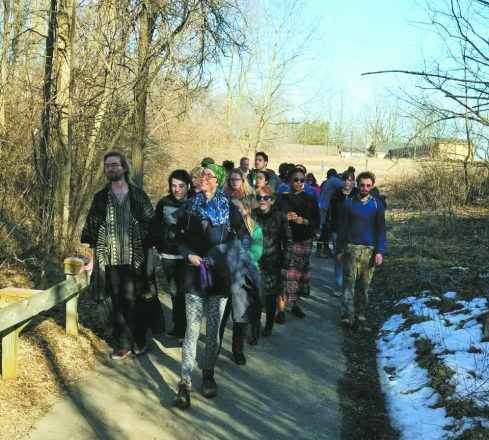 A meditative hike was led by certified forest therapist Cayla Samano of Ann Arbor. 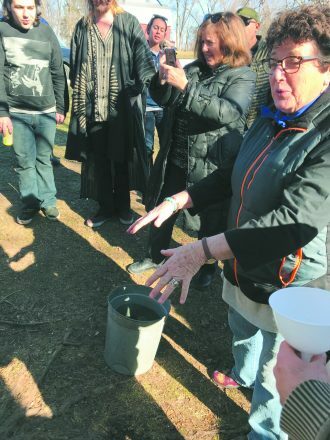 A volunteer shows participants how to turn sap into maple syrup. 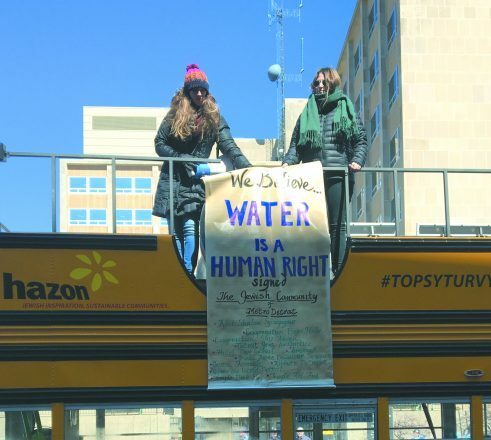 Hazon Detroit took its Topsy Turvy Bus that runs on used vegetable oil to Lansing for World Water Day 2018 on March 22, which was organized by Grand Rapids Water Protectors and People’s Water Board. 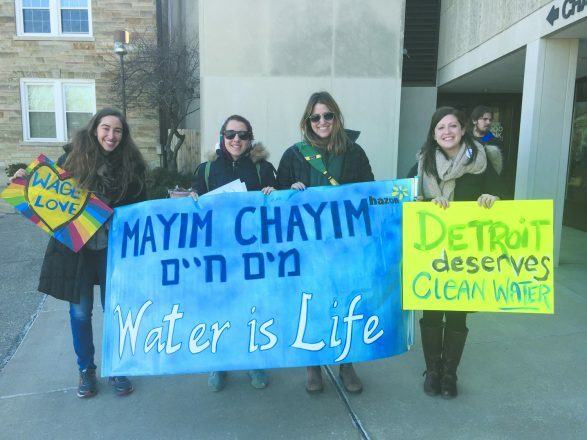 Hazon represented many from the Metro Detroit Jewish community who believe water is a human right. “We drove the bus to show we can flip the environmental story on its head, that by opening minds and stretching imaginations, we have the power to solve the most pressing issues of our time,” said managing director Sue Salinger. 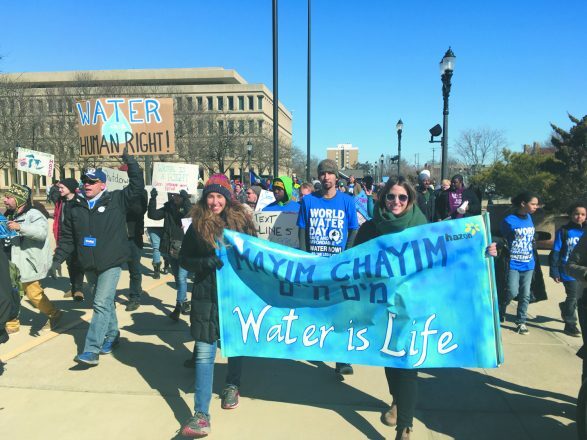 Hazon brought the Jewish voice to the water struggle, representing 13 Jewish institutions (and 5,000 individuals). 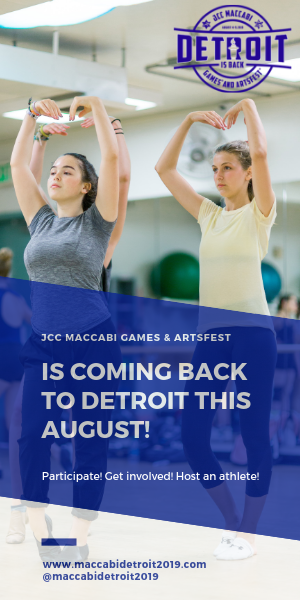 Adat Shalom Synagogue, Detroit Jews for Justice, Jewish Ferndale, Tamarack Camps, Isaac Agree Downtown Synagogue, Repair the World: Detroit, Temple Kol Ami, Congregation Shir Tikvah, Congregation Shaarey Zedek, Congregation B’nai Moshe, Kibbutz Detropia, Temple Beth El and Hillel Day School signed on to a declaration that water is a human right. 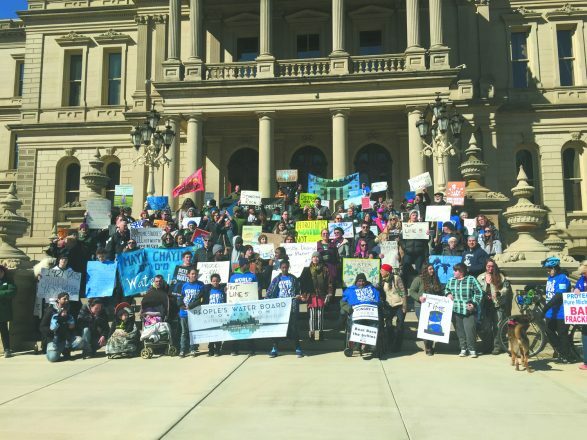 Group photo at World Water Day in Lansing — Hazon represented 13 local Jewish organizations and 5,000 individuals who signed a declaration that water is a human right.